CHAIN - Auto Wheel Services, Inc. Features a minimum break force of 7,000 lbs. Features a minimum break force of 5,000 lbs. Features a minimum break force of 2,000 lbs. SAFETY CHAIN,3/8" X 18" W/FORGE SLIP HOOK,CLASS 4,10,000 LB. SAFETY CHAIN,3/8" X 22" W/FORGE SLIP HOOK,CLASS 4,10,000 LB. 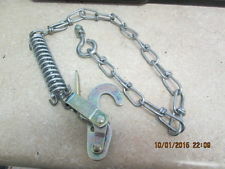 SAFETY CHAIN,3/8" X 35" W/FORGE SLIP HOOK,15,000 LB.